“Whether it be a concert, a film, a play or other “arts events” we always want to improve and provide the best,” the emailed survey from the office of festival director Dr. Vince Georgie, a marketing professor at the University of Windsor, says. The first section asks responders’ media and arts preferences. Do they read, listen, watch or use billboards, radio, social media or magazines, for example. It asks what kind of events they attend on a never, once in the past year or more than once a year basis – from the casino to film, musical theatre, event, sports or a rock concert. It asks people’s preference whether these be film, dance, music and theatre. It asks how far in advance they plan for an event, their preferences for ordering tickets, such as by email or in person at the box office. Specifically, it asks how well people use the downtown Capitol Theatre and attendance there of events such as 4th Wall Music, Bookfest Windsor and Media City Film festival. 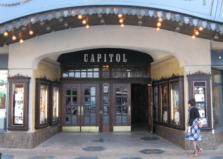 And how users rate Capitol Theatre services such as quality of the restrooms and ushers. Then it asks about demographics - age, employment, gender and highest level of education. There are incentives to complete the survey, such as a free ticket when one is purchased to the Windsor Symphony, and three prizes such as a pair of tickets to the film festival or 4th Wall Music. Georgie did not return requests for comment about how the survey will be used.